I see that Kili is clipped on your wing raising trick. Does she have troubles flying to perches soemtimes or no? 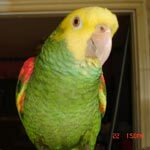 If not will a clipped Parakeet be able to do the same things he does with no problems; or will there be problems like being scared or hesitant? Kili was clipped when I bought her but never since. She's missing a bunch of feathers on one wing though because of complications resultant from clipping. She flies fine despite her handicap but never as good of a flier as one that never was clipped. Ah OK so if I get a Parakeet that is clipped it should fly right? The point of clipping is so that it can't fly. You don't have to clip them if you don't want to! Your bird would probably prefer it if you didn't. Mine are not clipped, except Malachite, who was clipped by a previous owner. Poor Rambo is a pedestrian probably because of a bad clipping. He looks like walking through the house. Michael wrote: The point of clipping is so that it can't fly. Not that they can't fly, but that they're flying capabilities are limited. parrotlover wrote: Ah OK so if I get a Parakeet that is clipped it should fly right? If it is a proper clip, then the budgie will be able to fly short distances, but will not have very good lift, and will glide to the ground. Most pet stores and breeders will clip budgie wings. They will grow back. I highly suggest letting the wings grow out. You will have a happier and more confident bird. OK Thanks! and hey Zaza can you PM me please?